Unless otherwise stated, these short professional courses will take place in Rowena's Central London home/studio; just a three minute walk from Holborn tube station. Dates, times and prices are included within each course description. Places are confirmed on receipt of full payment. If you would like to enrol or have any questions before booking, please email rowena@rowenalukeking.co.uk or complete and send the form at the bottom of this page. so please do keep an eye on this page and/or subscribe to mailing list. In the words of Lidewij Edolkoort "The exodus of fashion will change the landscape of what is the culture of clothes. My hunch is that we will see the comeback of couture as a major benefit. After all it is in the atelier of couture that we will find the laboratory of this labour of love" Trend Union, Anti_Fashion Manifesto. COUTURE HAND SEWING parts 1, 2 and 3 will introduce you to the timeless art of stitching garments by hand as you use vintage dress patterns, adapted and reduced to quarter-scale, to make a miniature summer dress, a 'little black dress' and a wedding dress. As a feature of these courses, you will be shown how to make your own quarter-scale tailors dummy. PART 1 - THE SUMMER DRESS. Starting at the beginning by producing a stitch chart and a series of samplers showing how each stitch is used in dress making, you will be shown how to hand stitch different types of hems and fastenings and make in perfect quarter-scale a hand stitched summer dress. Using a Liberty Tana Lawn print for your miniature dress, by the end of Couture Hand Sewing Part 1 you will have the confidence to hand stitch a summer dress for yourself. Dates: Five Alternate Saturdays; 27th April, 11th & 25th May, 8th & 22nd June 2019. Maximum 3 students. Lessons start at 10.30am and finish at 4.00 pm allowing for a 30 minute lunch break. Price: £425.00 including equipment and materials. please contact Rowena by completing and sending the form at the bottom of this page. PART 2 - THE LITTLE BLACK DRESS. At intermediate level, during this part of the course you will learn how to work with more luxurious fabrics such as silk and chiffon. You will add to your folio of swatches; learn how to stitch the different types of seams used when working with luxury dress fabrics; roll a hem, add beads and attach a side zipper as you make a 'little black dress' in quarter-scale. Dates: Five Alternate Sundays; 28th April, 12th & 26th May, 9th & 23nd June 2019 (Full). Or: Five Alternate Saturdays; 5th & 19th October, 2nd, 16th & 30th November. Maximum 3 students. or 'Hand Sewing for Couture & Bespoke Fashion' with Rowena Luke-King at Central Saint Martins. PART 3 - THE WEDDING DRESS. At advanced level this part of the course will build on everything that you have learnt in parts 1 and 2. You will be introduced to decorative details such as rouleau loops and fabric flowers; learn how to appliqué lace; attach Rigiline boning for support; use Crin and tulle for extra fullness and insert a concealed zipper as you make in perfect quarter-scale a floor-length dress with train, for a traditional white wedding. Dates: Five Alternate Sundays; 6th & 20th Oct, 3rd & 17th Nov, 1st Dec 2019. Maximum 3 students. Price: £475.00 including equipment and materials. Designed for people who already have competent hand embroidery skills, during this course you will create a reference book of techniques and stitches developed throughout history and across the globe to make precious, heirloom items such as a brides trousseau or a christening robe. Vintage needle-woven lace with Tenerife wheels. You will be introduced to needle-weaving as you create samples of embroidered tulle, drawn thread work and Tenerife lace. You will experiment with insertion stitches, appliqué and hand quilting and perfect a series of more advanced raised stitches, to create relief on both opaque and transparent fabrics. As a feature of this course you will learn how to design and embroider within a specific garment shape, set-up and work on a small 'slate-frame' and use tea and coffee to dye different tints of white. Dates: four-day weekend; Dates to be confirmed. Maximum 3 students. Lessons start at 10.30am and finish at 5.15 pm allowing for a 30 minute lunch break. If you haven't done embroidery before, Embroidery Level 1 at CSM is the perfect introduction for this course. EMBROIDERED NEEDLEPOINT FOR FASHION. During this course you will be introduced to different styles of traditional needlepoint including Florentine and Plush Work as you embroider and make a small, kiss-clasp coin purse. 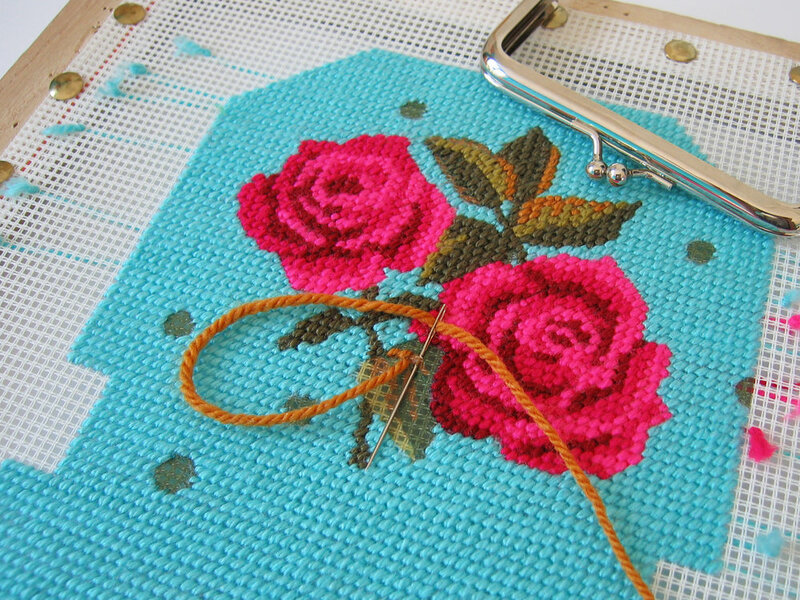 Needlepoint roses for kiss-clasp coin purse by Rowena Luke-King. Starting with a simple Tent Stitch, you will experiment with a selection of canvases and tapestry threads as you progress to more complicated techniques such as Mosaic, Parisian and Renaissance Stitch. You will learn how to create raised velvety surfaces with Loop Stitch attach beads for Victorian Beadpoint; Shisha mirrors for a more eclectic 'on trend' look. With a choice of transfer images specifically designed to fit the pattern for your kiss-clasp purse frame, you will learn how to use the colour wheel as you choose the threads for your final piece. You will learn how to block and steam your work back into shape once embroidered; stitch your purse fabrics together, insert a lining and attach your kiss-clasp frame. No Previous experience is needed for this course. A four-day weekend; 12th, 13th, 14th and 15th April 2019 (full). New dates to be confirmed. If you would like to book a place on any of the short courses outlined above or have any questions before booking, please contact Rowena by completing the form below and submit it by clicking on the 'SEND EMAIL NOW' button.